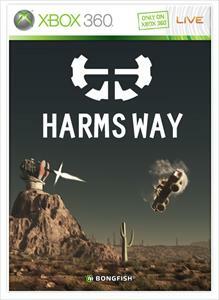 Harms Way is a free Xbox Live Arcade game that was released last month as part of the Doritos “Unlock Xbox” challenge. As one of the two finalists of this contest (the other being Crash Course), Harms Way tackles the genre of action racing. 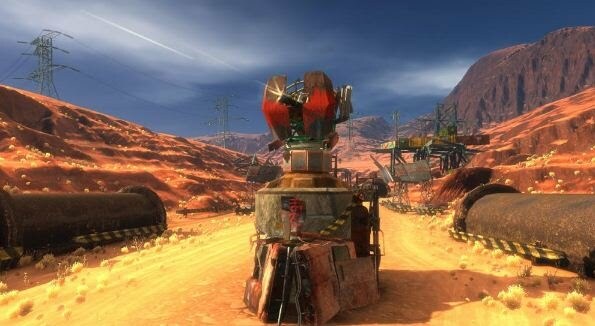 The core racing is basically a budget version of Motorstorm, but there is also the added dynamic of being able to control a turret, and that sets it apart from similar titles. Basically, you have the option to either drive or shoot. If you elect to drive, you choose one of four off-road vehicles and participate in a simple race with the options to obtain basic power-ups (nitro boosts, shields, etc). If you decide to shoot, you control the handful of turrets scattered around the course, and your job is to blow up the racers. Both concepts are simple enough, and it’s an easy pick-up-and-play type game. Single player mode gets old quick, but thankfully there is the ability to play with others (both splitscreen and online). The online community is pretty dead, so it is best to go to the local multiplayer route. In a bit of a pleasant surprise, Harms Way is a good-looking game. The graphics could easily pass for a PS2/Xbox title, which is more than what can be said about other like-minded XBLA titles. Developer Bongfish really put a lot of effort into making this look better than it really should. As a free game, Harms Way is more than adequate. Although light on content, its multiplayer options provide enough depth to bring gamers back for the casual game now and then. That’s all you can really ask for out of a free game. Hopefully Bongfish continues to create new games; it would be nice to see them develop a more fleshed-out title in the future. – It should be noted that this game offers a ridiculously easy 200 gamerscore if you’re into that sort of thing.